Trying a new app on iPhone that’s supposed to post to my blog. We’ll see how this goes. I’m at the 8Eightyeight Lounge in Fullerton. Frankie the manager talked me to a Gurkha Evil, but he’s going to owe me one for this travesty. Harsh just turned into slightly less harsh, and it won’t stay lit worth a damn. It’s evil all right, but not in a good way. A 6.0 on The Morris Scale. 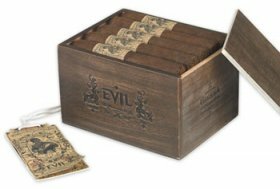 Go here for an extensive review of the Gurkha Evil (this reviewer liked it a whole lot more than I did).